Did the total Solstice Lunar Eclipse of December 21st, 2010 rise over Obama’s Red Sea of Change? Is Obama Drowning America in the Red Sea of Obamunism? On Dec 21st, 2010, a Total Lunar Eclipse occurred on the Winter Solstice. 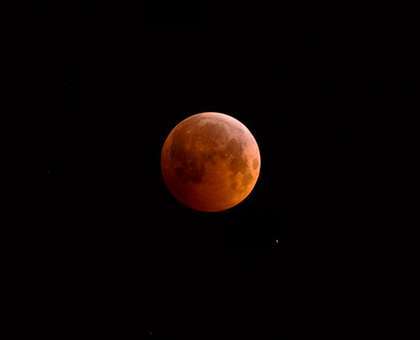 The copper red, luminescent orange color was caused by indirect sunlight passing through Earth’s atmosphere during the total eclipse when the full moon passed nearly dead-center through the Earth’s shadow for 72 minutes (2:41 am to 3:53 am EST). According to Geoff Chester of the US Naval Observatory, the rare Solstice Lunar Eclipse has only occurred twice in 2,010 years. The last Solstice Lunar Eclipse was 372 years ago on Dec 21st, 1638 and the next one will be on Dec 21st, 2094. Brian Williams, Katie Couric, Charlie Gibson, Rush Limbaugh and Barack Obama sing about America’s new savior Barack H. Obama Superstar. “Obama Christ Superstar,” a parody of Hosanna from Jesus Christ Superstar, was written and performed by the Bob Rivers Show on KZOK 102.5 FM. The video was created by HerBunk Productions. The voice animation was created by using the application CrazyTalk. Would you save our stocks? Tell the liberals to be quiet. Why does everybody buy it? That they are fools to go along. Obama sounds like Osama but he’s not. Barack is like JC, he’s alright by me. No one will be foreclosing on your homes. Every little child would have some health care. The war would end at last. Go Bama, hey, gonna vote Bama. He beat Hillary, now the GOP. Bama, O-bama, he’s our Superstar.